The 10 Best Unique Bars in Alabama! To most folks, a bar is just a bar. But people in Alabama know that there's a lot more to a bar than just the drinks. Here you'll find no shortage of unique bars that know how to make your night on the town extra special. Whether it's a long-standing history, unique architecture, or a certain type of ambiance that's hard to duplicate, you'll want to grab a seat and a drink at these 10 best unique bars in Alabama. Is it a bicycle shop, or a bar? Actually, it's a little bit of both. This unique bar has bicycles hanging from the ceiling And a menu that's just as unique as its decor. Things like pork belly tacos and smoked duck nachos, and a killer Sunday brunch are just a few of the treasures you'll find inside. You'll never see anything quite like it anywhere else. With better-than-bar food and a collection of modern and classic video games, this throwback arcade-slash-bar has become an icon of downtown Birmingham. Old school Pac-Man, Street Fighter, and pinball will delight and entertain you for hours. They also have their fair share of handcrafted cocktails, some of which are named to pay homage to old-school pop culture icons. The reimagined periodic table of elements adorning the bar’s backdrop is a crowning jewel of this favorite Birmingham spot. But rather than giving information but about the elements, the chart shares highlights of Birmingham history and culture. 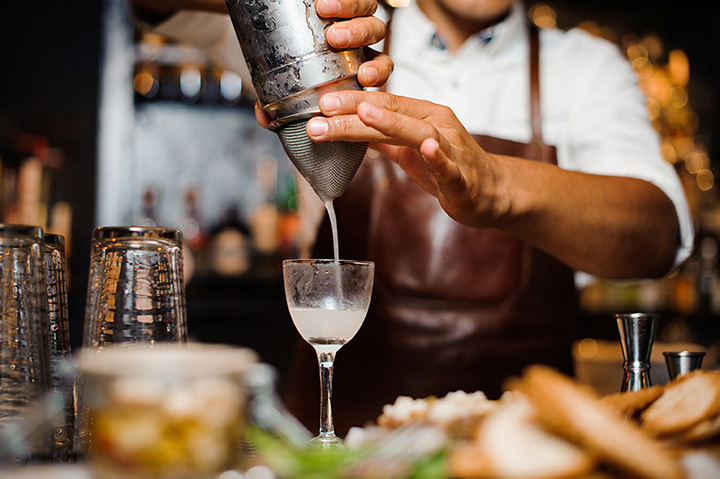 One of their biggest achievements for this award-winning bar is the fact that every cocktail is of their own creation. Just tell them what you like, and they handle the rest. It's the purest form of mixology you'll find in the state. The good news is you don't have to walk the plank to get a good drink at Pirate's Cove. But you will feel as though you’ve stepped aboard an epic adventure. This waterfront bar comes complete with a sandy beach and long dock to give you plenty of fun in the sun and in the water every time you visit. Whether you're inside or out, every day is a parrrty. If biggest beer selection were contests in Alabama, then the Nook would surely take first prize. They offer over 500 beer selections on their menu, and you'll want to come again and again to try them all. The atmosphere is warm and inviting, offering plenty of seating arrangements for parties of all sizes, inside or outdoors. No, they're not serving up freshly-made furniture on a plate. The slide music venue and bar features and outdoor stage tons of outdoor tables and chairs, and outdoor bar, and indoor bar, and plenty of TVs to go around. Locals agree it's also a great place to grab a meal anytime, especially if you're craving something unique and original. Step aboard this stunning restaurant and you'll feel like you're about to set sail into Terry Cove. But rest assured that though the bar may look like a boat, it is well grounded on shore. That doesn't mean your experience will fall short of adventure. You’ll enjoy aquatic views, attentive service, and high-quality food and drink in one of the best atmospheres in Orange Beach. This Irish pub is far from typical, doubling as one of the best music venues in town. They share their large, spacious back patio with two other epic bars, so traveling to each one is never a problem. They also have an impressive draft beer selection so you're always sure to find something new. As the name implies, this aviation-themed bar pays homage to all those who have served our country from miles above the ground. This place is part bar, part entertainment venue, and part history lesson, with plenty of airplanes and other fitting decor throughout the facility. This is the kind of place where you'll definitely want to sit and stay awhile, so make sure you stop in when you have plenty of time—you’ll be glad you did. This off-the-beaten-path bar is the type of friendly neighborhood hang-out that every city wishes existed in their own backyard. Touted as one of Homewood's best kept secrets, this place has a diverse clientele with a menu to match. It's funky location alone makes it one of the most unique bars, but its friendly, down-home ambience reminds you that you just don't find bars like this anymore. View more Alabama Bars and Saloons.